"This Has Never Happened Before": JPM's Kolanovic Spots An "Unprecedented Divergence"
Over the weekend, when discussing the recent bifurcation between the US and emerging markets, we noted that one shouldn't pay attention to the "significant role played by the sharp decline in the EM tech sector, especially after the recent collapse in Tencent stock and more recently, the sharp drop in JD.com following poor earnings." Furthermore, we said that "since the start of June, the EM tech sector has accounted for c.40% of the decline in the value of EM equities, with the Chinese internet names the primary drivers following recent regulatory challenges and poor results. And, as the chart below highlights, this has opened up a record divergence in tech performance between the US and EM. 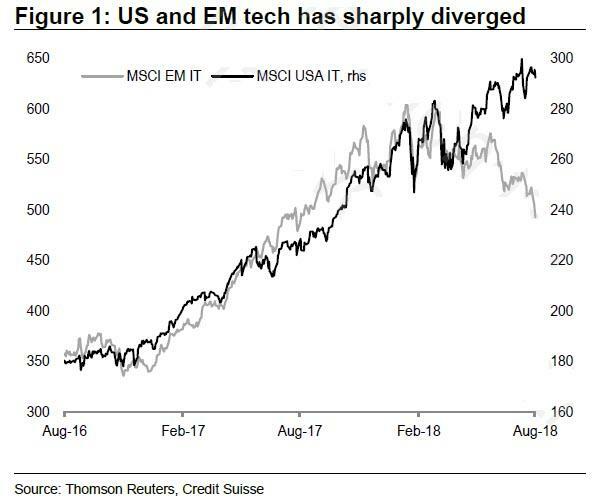 Needless to say, such a divergence is unusual: in the 18 months to the end of June this year, both the US and EM tech sectors rose by 50% in USD terms. Since then, the EM tech sector is down 6%, while its US counterpart up by 5%." Two days later, none other than JPM's quant guru, Marko Kolanovic also spotted this bizarre phenomenon, and in a note published earlier today writes that "the recent divergence in the performance of US Equities vs. the rest of the world is unprecedented in history". Specifically, Kolanovic looks looks at price momentum which he finds is "positive for US stocks and negative for Europe and Emerging markets across all relevant lookback windows." Over the past 20 years, even the individual regional indices rarely had such a divergence (for instance, the divergence of US and Europe momentum happened only 2 times). Given that this is such a rare occurrence (has never happened for both Europe and Asia), it suggests to us this is a market condition that will not persist. In other words, something will give – either the US will fall or EM and Europe equities will catch up and move higher (the historical sample of these events is too small to statistically infer which way this convergence will most likely happen). We believe this market setup has been driven, in part by fundamentals, but also significantly by technical drivers. The JPM strategist then breaks down the causes for this divergence which he lumps into two constituents categories: fundamentals and technicals. In fundamentals, he lays out all the usual talking points we have noted in recent weeks that explain why the S&P just hit a new intraday high, oblivious of events in emerging markets: these include "Trump’s tariffs and sanctions causing broad equity risk aversion and a rally in the USD against a backdrop of strong support for US equities from buybacks, tax-related earnings boosts, as well as inflows from systematic strategies since April." The trade war is also negatively impacting China equities and CNY, and there are a number of largely idiosyncratic developments from Turkey, Italy, Argentina, Russia, etc. that weigh on equities and currencies outside of the US. As Kolanovic summarizes, "buybacks are creating a shortage of US stocks, the Fed is creating a shortage of US dollars, and Trump’s trade wars and sanctions are further boosting the USD." Kolanovic then falls back on his bread and butter: low liquidity and systematic flows, i.e. the technicals, which further boosted the divergence between the US and the rest of the world. Low liquidity is magnifying the impact of any fundamental and speculative flows, resulting in large moves and numerous flash crashes (e.g. ZAR, TRY, several prominent stocks, etc.). Systematic equity investors are on one side shorting Europe and EM equities, and on the other side buying US equities. For instance, CTAs and related macro trend-following strategies currently have about average long equity exposure in aggregate (52nd percentile). Given that all trend signals in Europe and Asia are short, and all US signals are long – these investors have large long exposure to US stocks and short exposure in Europe and Emerging market stocks. ... since April, various volatility targeting strategies have added up to $100bn in equity exposure, mainly in US equity indices – another tailwind predominantly for US stocks. This rotation of a few hundred billion dollars of equities into the US purely on technical factors, "was further reinforced by the significant ‘same way’ flows in currencies, commodities and rates. Significant outflows from EM FX, EUR, etc. and into USD are making long USD a crowded position." 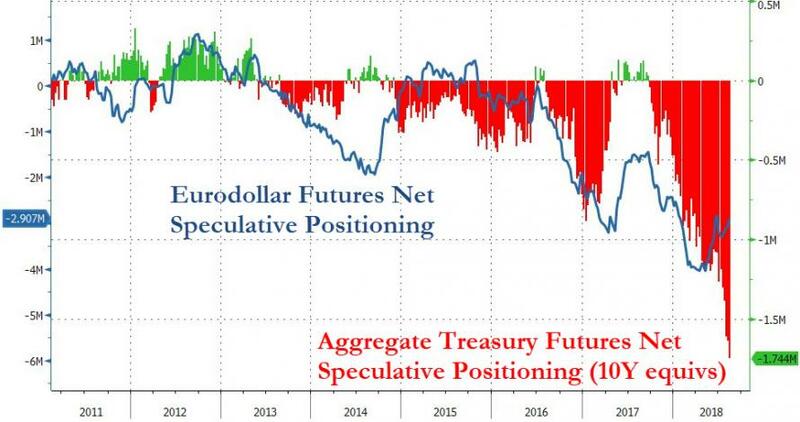 Meanwhile, as we noted over the weekend, and as Jeff Gundlach notably highlighted last Friday, investors are also shorting bonds (as non-commercial shorts all-time highs), while going long US equities via index futures and short volatility positions. To Kolanovic, this type of crowding is very similar to early 2016, which led to a subsequent rally of Value and EM assets and USD selloff. “Risk on, USD down” outcome with EM and value assets staging a rally and USD selling off, while US stocks continue going higher (but lagging). Alternatively, we could see a “Risk off, USD up” convergence, with US markets selling off and catching up with the poor performance of Europe and EM assets, e.g. driven by a continuation of the trade war and further USD strength (for now we will ignore a spectrum of ‘in-between’ outcomes). Maintaining his optimistic outlook which he has laid out every month this year, Kolanovic remains upbeat and writes that "the more likely outcome is a ‘risk on’ convergence, given decent global growth, cheaper valuations outside of the US, a continuation of buybacks in the US, intensified criticism of rate hikes and strong USD by US administration, new stimulative measures in China, and ongoing negotiations to resolve trade war with China. A ‘risk on’ convergence could be further fueled by poor liquidity and a short squeeze in currencies (EUR and EM FX), metals (precious and industrial), broad EM equities and China stocks." That said, Kolanovic cautions that "one should not dismiss a scenario in which the trade war with China is not resolved and the US market experiences a sharp correction. This could be further fueled by concentrated US market leadership, a decline in the high levels of equity HF exposure (e.g. HFRXEH beta in 95th percentile), and selling from systematic investors (e.g. Vol targeting funds are currently in their 66th percentile of equity exposure)." What could catalyze this "Risk off" convergence? An obvious potential catalyst for this scenario would be a breakdown in China trade negotiations, and continuation of the USD rally. escalating the trade war could cause a disproportionally negative impact on the US economy and equity markets at this stage. The disproportionally higher damage to US markets was described above in the context of the divergence of positioning and valuations. The USD rally effectively introduced ‘tariffs’ against US products sold globally. At the same time, the weaker CNY, EUR, etc. make their products more attractive across the world, including in the US. Given that China represents less than 20% of US total trade, the damage of tariff policies (and strong USD) on US trade could be several times larger (e.g. even up to 5 times) than any intended gain. The simple math is also likely a reason for recent nervous comments from the US administration about the Fed, rates, Chairman Powell, CNY and USD. It is a realization that the trade war in its current form is likely already lost given the strong USD. All of this, of course, trickles down to Trump, and his belligerent trade war rhetoric. And if Kolanovic is correct, the loss of the trade war couldh it at the worst possible time: just as companies report Q3 earnings... which is scheduled to take place just days before the midterm elections which Trump and the republicans - for fears of impeachment - can not afford to lose in a landslide. This is why Kolanovic concludes that "an escalation will likely be averted and that a trade resolution and weaker USD will lead to a ‘risk on’ convergence." That conclusion however, is contingent on one big assumption: that Trump will observe events playing out around the globe rationally, ignore the record stock market, and engage China with the intention of ending the trade war even though - in his mind - Trump is still winning the war. That is a big assumption.